After his near fatal test flight to clear a path for Alan Shepard on Freedom 7, the chimpanzee Ham lived for 17 years in the National Zoo in Washington, D.C., then in the North Carolina Zoo. He died at the age of 26 and was buried at the Space Hall of Fame in Alamogordo, NM, where it is not unusual to find a banana placed next to his memorial plaque by an occasional visitor. The Mercury capsule flown by astronaut Gus Grissom was recovered from the bottom of the Atlantic Ocean on July 20, 1999. It was found at a depth of more than 15,000 feet, 3,000 feet deeper than the wreck of the Titanic. Curt Newport, an undersea salvager who worked on the recovery of the space shuttle Challenger, TWA flight 800, and the Titanic, commanded the expedition. The capsule is on display at the Kansas Cosmosphere in Hutchinson, Kansas. 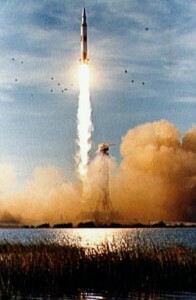 NASA engineer Sam Beddington worked to determine the cause of the blown hatch. According to his final analysis, when the capsule landed in the water, the cable dangled loosely and the exterior hatch handle got caught up in the landing bag straps. As the spacecraft moved up and down in the swells, the cord pulled tighter and tighter against the handle until it pulled tightly enough to trigger the hatch to blow off, just as Grissom had described. A photograph of Ed White’s space walk on the cover of Life magazine made the Omega Speedmaster watch instantly recognizable. 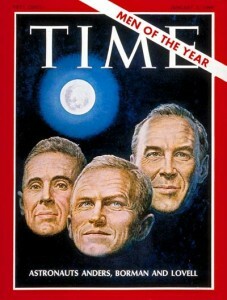 “Omega didn’t even know that NASA was using the watch until they saw that photo,” said Apollo 13 Commander Jim Lovell. The watches were worn by astronauts on subsequent Apollo flights and can be seen on the wrists of the Shuttle astronauts. Walter Cunningham abhors being called a hero.”The only time he’s a hero around the house is when he carries out the garbage,” said his wife Dottie. 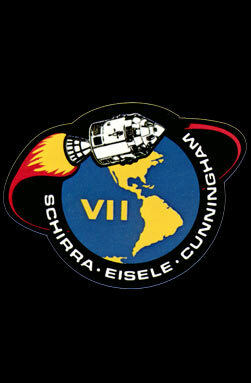 Schirra retired from the Navy as a captain and resigned from NASA on July 1, 1969. He died on May 3, 2007 at the age of 84. In October 2009, the USNS Wally Schirra was delivered to the U.S. Navy for use in transporting supplies to U.S. and allied ships at sea. Bill Ander’s journey to the moon radically changed his outlook on life and religion. Ironically, while the world was celebrating the astronauts’ affirmation of spirituality, the flight had undercut Anders’s own faith in his religion. The vast emptiness of space made the Catholic rituals he had obeyed faithfully since childhood seem insufficient to him and he ceased attending church. Rusty Schweickart became active in an international effort to develop methodology for deflecting the orbit of asteroids that threaten earth. The theory for predicting and deflecting asteroid impacts must be precise enough to assure that the resulting trajectory does not increase the probability of earth impact on future orbits, which could wipe out parts of civilization as we know it, the presumed eventuality of the dinosaurs some 65 million years ago. Schweickart’s B612 Foundation is dedicated to the development and implementation of these concepts. Tom Stafford became close friends with Russian cosmonauts during his training for the Apollo-Soyuz rendezvous mission in July 1975. In 2004, Russian history became part of his own when he and his wife, Linda, adopted Stas and Michael, two young boys from a Russian orphanage, and brought them home to the United States. After his Mercury, Gemini, Apollo and Skylab missions, Tom Stafford, a native of Weatherford, Oklahoma, noted that astronauts from Oklahoma had more time in space than any other State, although Oklahoma only had 2% of the population. 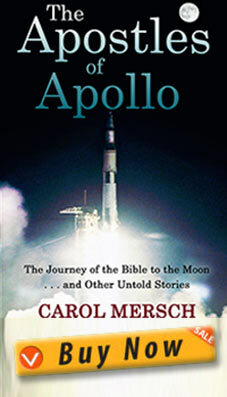 The first Bible passage known to be left on the moon was that of Pope Paul VI in his message from Psalms 8 etched on the commemorative silicon disk left in the lunar dust by Neil Armstrong and Buzz Aldrin, This, along with the Apollo 8 reading from Genesis 1, became the focus of a lawsuit by atheist Madalyn Murray O’Hair to halt religious acts by the astronauts in space. Buzz Aldrin, tired of the public relations routine, left NASA a year and a half after Apollo 11 in January 1971, returning to the Aerospace School at Edwards Air Force Base, commonly called Test Pilot School. Ironically, the first two classes of astronauts had to attend this school to qualify for selection as an astronaut. Buzz was turned down for the second selection because he had not served at Edwards. He returned as Commander. In the years following Apollo and Skylab, Apollo 12 Commander Pete Conrad remained an avid enthusiast of high-speed vehicles. In July 1999, at the age of 69, he died as he had lived, riding the wind, rounding a curve on his Harley on Highway 190 outside of Ojai, California. After leaving NASA, Apollo 13 Command Module Pilot Jack Swigert became staff director of the Committee on Science and Technology of the U.S. House of Representatives. He was elected to the U.S. Congress in November 1982 but died of bone cancer before taking his oath of office. Alan Shepard was a shrewd businessman and the only astronaut to become a millionaire while still in the program. After leaving NASA, he served on the boards of many corporations under the auspices of his Seven-Fourteen Enterprises, named for his two flights, Freedom 7 and Apollo 14. The microfilm copy of The Christian Science Monitor he carried to the moon was subsequently presented to the church headquarters in Boston. Stuart Roosa died 1994 at the age of 61. Although Roosa’s name was never as well known as Neil Armstrong’s or Alan Shepard’s, Roosa was buried with a full military service, including a flyover that shut down Reagan International Airport for fifteen minutes.Â Alan Shepard, the man Roosa had been deathly afraid of as a rookie astronaut, delivered the eulogy. The seeds Roosa carried on board Apollo 14 yielded “moon trees” sycamores, firs, sweet gums, and redwoods that stand on lawns from the White House to Japan, including one at his grave site in Arlington Cemetery. In 1974 Edgar Mitchell left NASA to form the Institute of Noetic Sciences (IONS}, an organization dedicated to sustainability of planet earth and the study of cosmic consciousness. In 1973, Wernher von Braun spoke at a fundraiser for the prospective organization, which eventually grew to a membership of over 30,000 members from 74 countries around the world. In their rush to depart the moon’s surface, Alan Shepard and Edgar Mitchell overlooked the last film casing that documented their traverse from Cone Crater. By the time they discovered it had been left behind, they were half way home. The conversation supposedly went something like that of a vacationing family searching for a missing ice chest left at a camp site.”Did you get it?” No, I thought you did.” The camera casing can be seen in photos taken by the lunar module camera during ascent from the moon, resting where they had left it in their lunar hand cart. In May 1972, David Scott learned that Van Hoeydonck, artist of the fallen astronaut figurine, planned to make replicas of the figurine left on the moon by the Apollo 15 crew and sell them. Feeling this would be a violation of the spirit of their agreement, Scott tried to persuade Van Hoeydonck to refrain. After negative comments from NASA regarding the intended sale, Van Hoeydonck retracted his permission for it and none were sold, despite having been produced. However, several of the replicas reside in various museums scattered across the globe. After forming High Flight, a Christian ministry in Colorado Springs, Colorado, Irwin joined Christian explorer, Bob Cornuke, in the search for Noah’s ark as described in Genesis 6. Cornuke later became Vice President of Irwin’s High Flight Foundation, an exploration consortium dedicated to lost biblical locations and artifacts. After Irwin’s death, Cornuke re-established his search for Noah’s Arc, following clues in the Genesis 11, which say the descendents of Noah journeyed from the east of the mountains of Ararat. According to Cornuke, they discovered a unique object of petrified wood with the appearance of beams. “But we are far from saying it is Noah’s Arc,” he concluded. The search continues. In December 1975, Charlie Duke retired from the Astronaut program to enter private business as owner of Duke Investments and Charlie Duke Enterprises. He is an active speaker and Christian lay witness for his own ministry, Duke Ministry for Christ. The repair technique used for the Apollo 17 fender that was inadvertently damaged by Commander Cernan’s hammer came from a former moonwalker, Apollo 16 Commander John Young, who reached a record 10.5 miles per hour in Apollo’s lunar rover he nicknamed, “Chitty Chitty Boeing Boeing.” Young spent the night at a laboratory in the Manned Spacecraft Center tinkering with another rover and using only materials Cernan and Schmitt had available to them on the moon. He even wore a spacesuit to see how long it would take the astronauts to do the work. 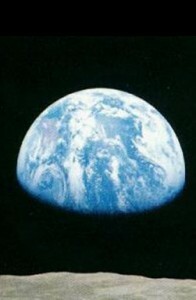 “Just call me the little ole fender-maker,” Cernan said when told what to do. The five pocket mice carried on board Apollo 17 were named Fe, Fi, Fo, Fum and Fooey. Four of the five pocket mice carried into space lived. One died of complications while circling the moon. In August 1975, Harrison (Jack) Schmitt resigned from NASA to seek election as the New Mexico Republican to the United States Senate. Schmitt faced two-term Democratic incumbent, Joseph Montoya, whom he defeated. Reverend Stout bought two copies of Ed White’s RSV version and cut them up to make the master for the First Lunar Bible showing all front-back pages. He did the same for the KJV edition 715. The single multi-focal Bible titled the “First Lunar Bible,”  was wrapped separately and accompanied the 100 NCR microfilm Bibles taken by Apollo 14 Lunar Module Pilot Edgar Mitchell to the lunar surface on February 5, 1971. Its whereabouts today is unknown. 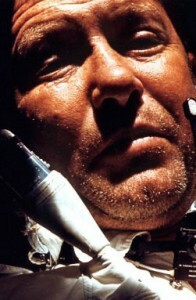 Kinzler, the NASA model maker whose team is credited with devising the Gemini 4 “zip gun”and the American lunar flags, went on to invent the parasail used as an emergency heat shield to save Skylab, the first U.S. orbital space station, which had its insulating materials torn off during orbit. NASA had a six-day window in which to fix the 120 degree heat problem. Kinzler’s enormous parasail was flown to the space station and deployed by Joe Kerwin and Pete Conrad, Kinzler’s friend and next-door neighbor. “I had to save Skylab for Pete,” Kinzler chided. For his Skylab rescue efforts, in 1973 Kinzler was awarded the NASA Distinguished Service Medal. Prior to January 1972, Flight Operations Director Deke Slayton was the sole individual responsible for reviewing and certifying contents of the astronauts Personal Preference Kits (PPKs). The PPK lists were not made available to anyone else. Pressured by complaints from the public information officials, after Apollo 15 NASA issued an Astronaut Preference Kit Policy governing articles that could be included in the astronaut’s PPK and prohibiting articles from being carried elsewhere, thus preventing six-iron golf heads and other such items from suddenly appearing on live television from the moon. Although the name change from Cape Canaveral to Cape Kennedy was endorsed by President Lyndon Johnson in 1964, it was not popular in Florida, especially in the city of Cape Canaveral who had grown rather fond of the original name. In 1973 the state passed a law restoring the former 400-year-old name, and the Board went along. The Kennedy family issued a letter stating they “understood the decision.” Jacqueline Kennedy said that if she had known the Canaveral name had existed for 400 years, she never would have supported changing the name. 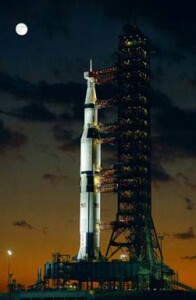 The Space Center itself retained the “Kennedy” name. Flight Director Gene Kranz never said, “Failure is not an option,” the phrase attributed to him in the movie Apollo 13. He did, in essence, say that, but not in those words. Gene Kranz’s vests became notorious and have since been valued in thousands of dollars. He confessed that he once unwittingly donated eight of them in a large rag bag with other clothes destined for his church’s thrift shop. The church organizer reported that one brought in almost $11,000. A few of the remaining vests can be seen on display at the Kennedy Space Center, the Kansas Cosmosphere, and the Smithsonian National Air & Space Museum. In January 25, O’Hair’s son William got down on his knees, confessed his sins, and asked Christ to come into his life. In 1980, he converted to Christianity and was baptized at a Baptist church in Dallas where he took up work as a preacher. In 1979, he testified before a Senate committee in Washington D.C, arguing for the Supreme Court Jurisdiction Act of 1979 to restore prayer in public schools which his mother had succeeded in banning. The act failed. In August 1995, the door to the office of American Atheists was locked and a note affixed saying the O’Hair family had been called out of town on an emergency basis. When O’Hair’s home was entered, breakfast dishes were sitting on the table, her diabetes medication was on the kitchen counter, and her beloved dogs had been left behind with no caregiver. Madalyn, then 76, along with her son Jon, 40, and granddaughter Robin, 30, vanished from their house on Greystone Drive in Austin, TX. Tax returns filed by groups affiliated with her organization of American Atheists suggest that Jon had taken $629,500 of organization money with him. In January 2001, David R. Waters, an ex-convict employed by Madalyn for American Atheists, led the police to three bodies buried on a Texas ranch outside of San Antonio. The bodies of Madalyn O’Hair, Jon Garth Murray, and Robin Murray O’Hair had been cut into dozens of pieces with a saw. Walter was convicted of their murders and sentenced to a federal prison, where he died of lung cancer in January 2003. 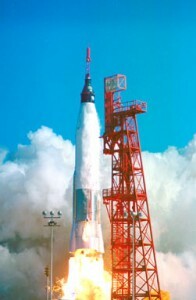 Slayton, like Alan Shepard, overcame his medical restriction and was eventually returned to flight status, flying the Apollo-Soyuz Test Project in July 1975 as Tom Stafford’s crewmate in the first US-USSR joint mission. This was the first flight of Deke Slayton, who was chosen as one of the original Mercury Seven Astronauts in April 1959. Slayton retired from NASA in 1982. He was president of Space Services Inc., of Houston, a company he founded to develop rockets for small commercial payloads. He died on June 13, 1993, in League City, Texas, from complications with a brain tumor. After leaving NASA, John Stout accepted a short-term assignment in San Antonio before moving to a remote location outside of Anchorage, Alaska, to work with the Information Transfer Program for the US Fish and Wildlife Service and the Department of Interior. While there, he served as a chemical engineering consultant during the Exxon Valdez disaster. Apollo 15 astronaut Jim Irwin, having left NASA to form High Flight Ministries, visited the Stouts in Alaska and ministered to them in their living room. The Stouts left Alaska in 1992 and retired outside of Houston. During the early years of the space program, Wernher von Braun became a close friend of John F. Kennedy and Walt Disney. He consulted Walt Disney on how Disney should construct a city of the future. None of the information was used, but Disney did get the idea from NASA for the Disney World underground operation. In 1970 NASA asked Dr. von Braun to move to Washington, D.C., to head up the strategic planning effort for the government space agency. He resigned from that position in 1972 and joined Fairfield Industries as Vice President. Before his death in 1977, he asked Fairchild constituent and spokesperson Carol Rosin to enlist the help of Apollo 14 Edgar Mitchell to elevate public awareness about the potential hazards of military use of orbiting space stations. The resulting publication, When Foxes Guard the Hen House, was completed by Mitchell and Rosin in 1988; however, due to political pressures, it was never published.